“Bird’s Eye View” accepted into International Society of Scratchboard Artists 2018 exhibit at the Middleton Arts Center. 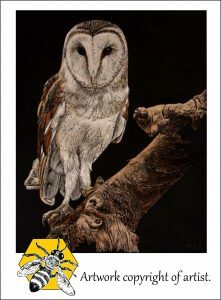 This is the 4th year Margaret has works accepted into this annual show of scratchboard art. A Barn Owl scanning the distance for his prey.